CSM Professor Wendy Hayes and CSM student Usaamah Al-Farooq work through one of the many real-world cyber security challenges in the CyberStart Game, an online platform featuring hundreds of hours of realistic examples and threats faced by cyber security experts in the field. College of Southern Maryland (CSM) students recently participated in the launch of Cyber Fast Track Maryland, a new program established to help close a widening gap of job openings in the cybersecurity field. The free, one-day event was tailored for Maryland community college students to give them a chance to show off their skills and meet with cybersecurity experts from Cisco, IBM, GEICO, Vanguard and Fannie Mae, to name a few. 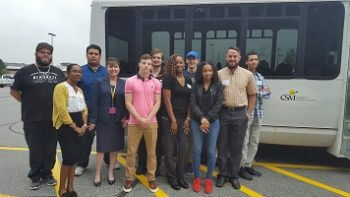 Students representing CSM at the Cyber Fast Track Maryland event were Aljan Tablizo, Myea Kelly, Jeremy Foster, Samala Howard, Netsanet Deribe, Jeremy Plum, Gage Beavan, Usaamah Al-Farooq, Cody Hight and William “Preston” Fouch. From left, CSM students Jeremy Foster, Netsanet “Netsy” Deribe, Aljan Tablizo, CSM Instructor Wendy Hayes, students Gage Beavan, Cody Hight, Samala “Sam” Howard, Jeremy Plum, Myea Kelly, William “Preston” Fouch and Usaamah “Sammy” Al-Farooq recently participated in the launch of Cyber Fast Track Maryland, a new program established to help close a widening gap of job openings in the cybersecurity field.